Autumn is slowly creeping in. Firstly, as you begin to notice the leaves changing, fog appearing and a crisper breeze in the air. Then it’s time to celebrate, the new season is here. Consequently, Dust off your chunky throws and replace your slippers with fluffy boots. But also think about your interiors, do they offer a cosy and welcoming feeling for you and your guests? More so, this month we’re helping you get your home ready for the new season. Not only but also, Autumn is just around the corner and with our range of new vintage designs and sultry autumnal shades, creating an Autumn Vintage setting has never been easier. Lastly, we’ve picked our key items to help you give you home a warm and inviting aura. We’ve all seen them, beautiful clusters of decanters and carafes, lined up behind cabinets in the swankiest of bars and restaurants. Evoking warm sentiments, merry occasions and good times. 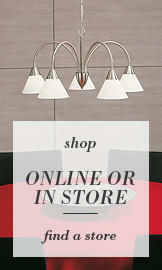 Now you can enjoy this classic vintage design in your own home with our new range of Decanter Table Lamps. This limited edition collection offers 3 stunning cut glass decanters that feature one dainty G4 bulb giving the glass a soft glow when lit. Available in 3 autumnal finishes, this is a great piece to add some warm and inviting vintage flare to your new season home. If cut glass isn’t your style then add brass, bronze or copper table lamps with diffusing opal glass shades such as our Rame Antique Brass Table Lamp to keep with the autumnal theme. Twinkles of sparkling champagne and sultry smoke glass will give your home an inviting ambience. When lit, amber champagne and smoke glass diffuses the light giving a warmer glow. Our Madonna Antique Brass Chandeliers feature warm champagne crystal droplets together with clear to give an autumnal ambience. The brass finish completes the antique effect. For a more unique style our Gatsby Pendant Ceiling Light 3 Cluster With Glass Shades compliments our new Decanter Table Lamps. Three cut glass decanter shades suspended from chrome wires to create a clustered sculptural piece. Suspend in hallways, landings and stairwells for optimum effect. Keep yourself, your family and your guests cosy and warm this Autumn with some new season inspired soft furnishings. Gold and Neutral tones are a great base for an Autumn vintage interior as they can be layered up whilst remaining discreet. Our Venus Round Cushion in Gold offers both luxury and simplicity, layers of frills create a powderpuff-like design evoking a vintage powder room feel. Pair this with our Amber Throw Over in Buttermilk for a vintage boudoir. You can add hints of grey textiles to compliment the smoky grey glass fittings, this will also give your room contrast and depth. 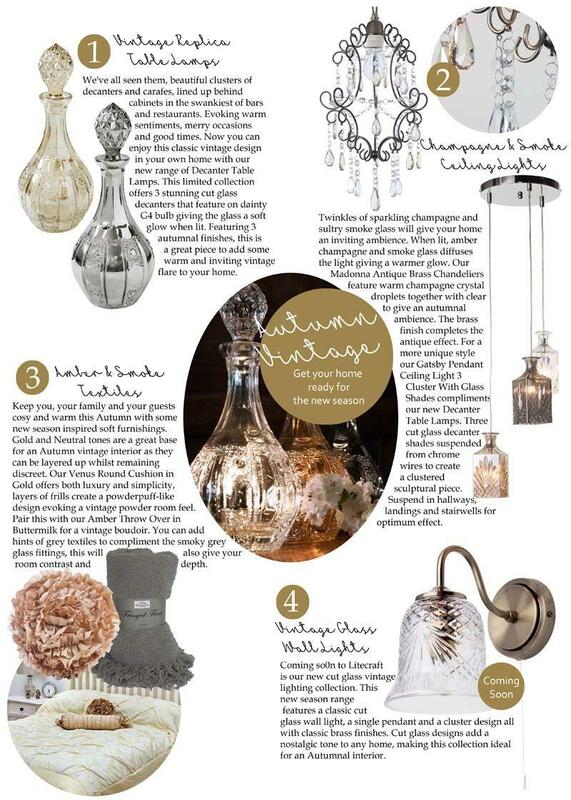 Coming soon to Litecraft is our new cut glass vintage lighting collection. This new season range features a classic cut glass wall light, a single pendant and a cluster design all with classic brass finishes. Cut glass designs add a nostalgic tone to any home, making this collection ideal for an Autumnal interior.